Základní cena zahrnuje: Leteckou dopravu v turistické třídě Transfery z letiště do hotelu a zpět metrem 2 noclehy v hotelu Hostel 8237 London se snídaní Technického průvodce Pojištění Fakultativní služby: Příplatek za jednolůžkový pokoj 1. 790, - Kč Příplatek za silvestrovskou večeři 1. 990, - Kč Povinné příplatky: Povinný příplatek za letištní taxy Orientační ceny vstupy: Tower 15 GBP Westminsterské opatství 10 GBP Muzeum Madam Tussaud´s 23 GBP London Eye 13 GBP Informace: Silvestrovská večeře je realizována při minimálním počtu 15 osob. Změna programu vyhrazena. 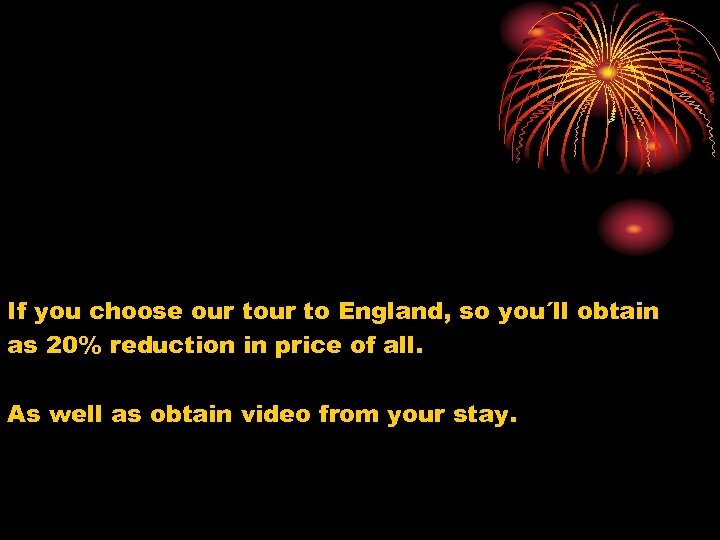 If you choose our to England, so you´ll obtain as 20% reduction in price of all. 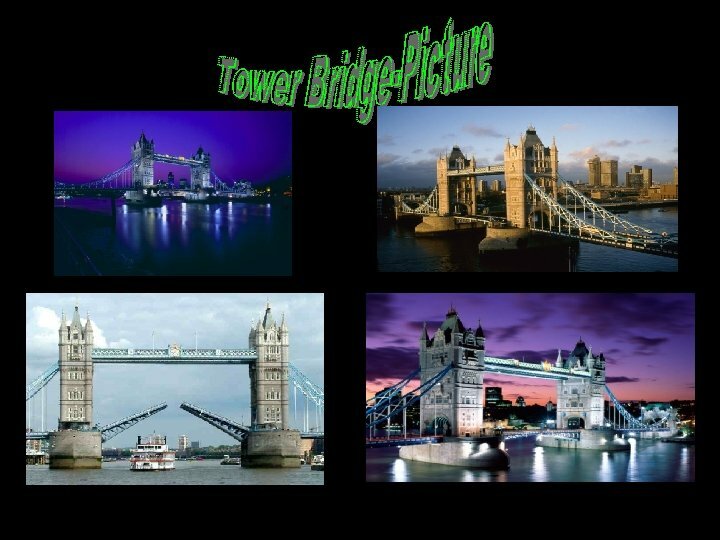 As well as obtain video from your stay. 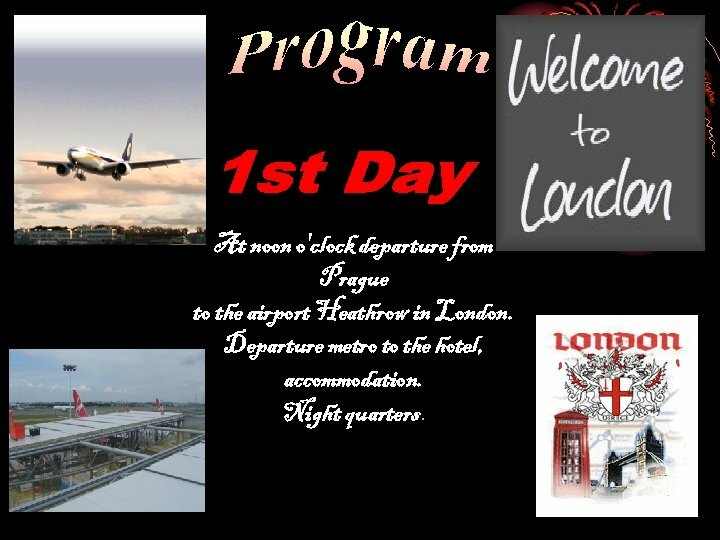 At noon o'clock departure from Prague to the airport Heathrow in London. Departure metro to the hotel, accommodation. Night quarters. 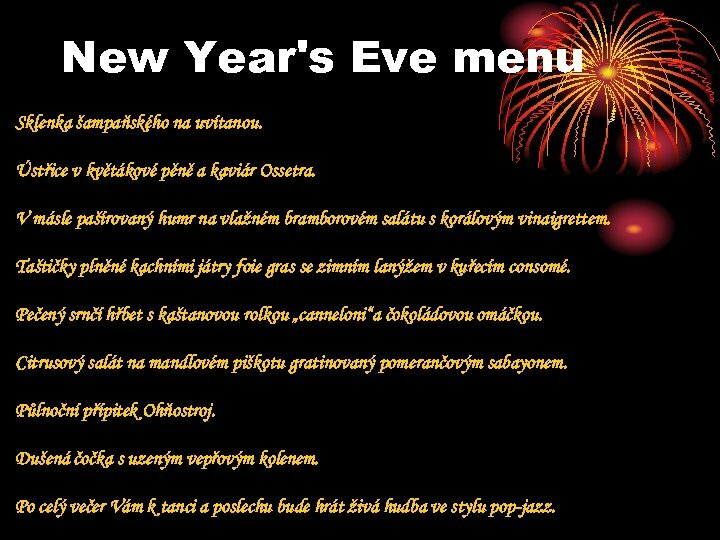 New Year's Eve menu Sklenka šampaňského na uvítanou. Ústřice v květákové pěně a kaviár Ossetra. V másle pašírovaný humr na vlažném bramborovém salátu s korálovým vinaigrettem. Taštičky plněné kachními játry foie gras se zimním lanýžem v kuřecím consomé. Pečený srnčí hřbet s kaštanovou rolkou „canneloni“a čokoládovou omáčkou. Citrusový salát na mandlovém piškotu gratinovaný pomerančovým sabayonem. Půlnoční přípitek Ohňostroj. Dušená čočka s uzeným vepřovým kolenem. Po celý večer Vám k tanci a poslechu bude hrát živá hudba ve stylu pop-jazz. Breakfast, possibility distributively visit square before Buckhingham palace and see exchange guards, further advise visit Trafalgar Square and watch local colour with pigeons quite typical for this place. 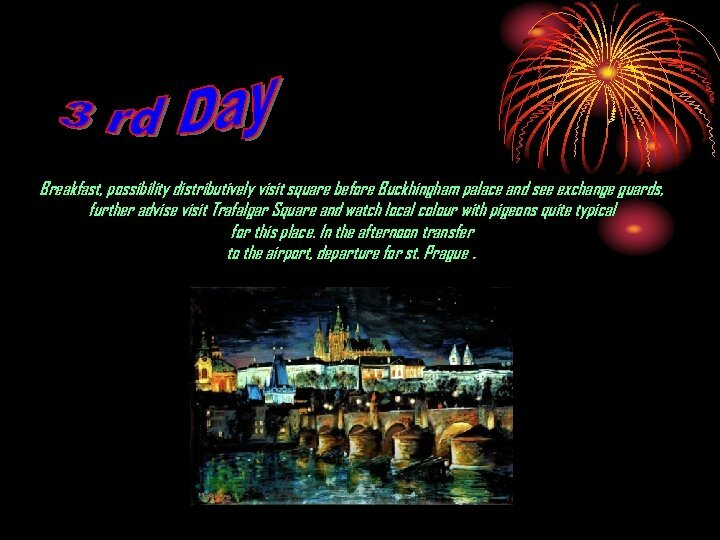 In the afternoon transfer to the airport, departure for st. Prague. 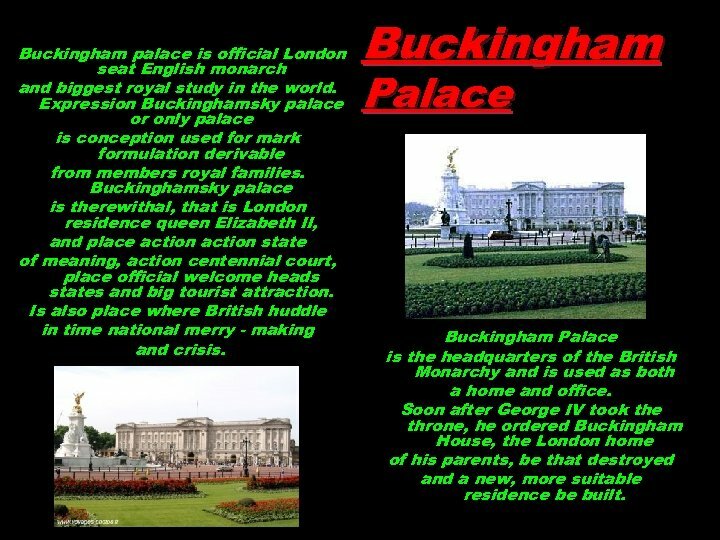 Buckingham palace is official London seat English monarch and biggest royal study in the world. Expression Buckinghamsky palace or only palace is conception used for mark formulation derivable from members royal families. 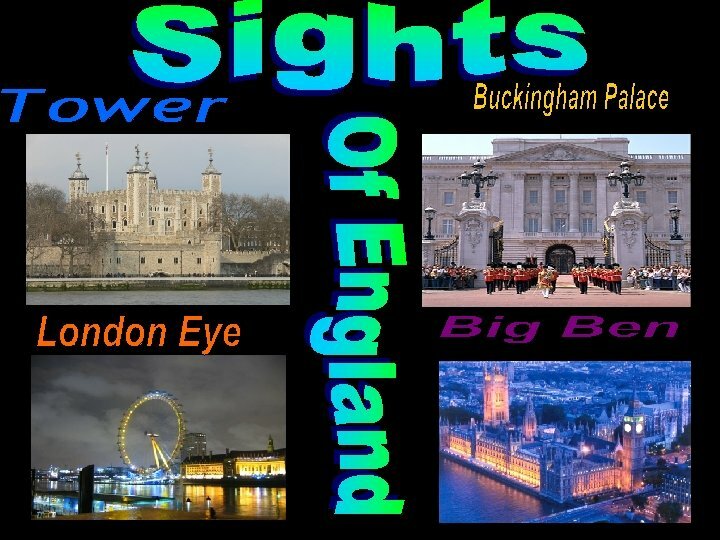 Buckinghamsky palace is therewithal, that is London residence queen Elizabeth II, and place action state of meaning, action centennial court, place official welcome heads states and big tourist attraction. 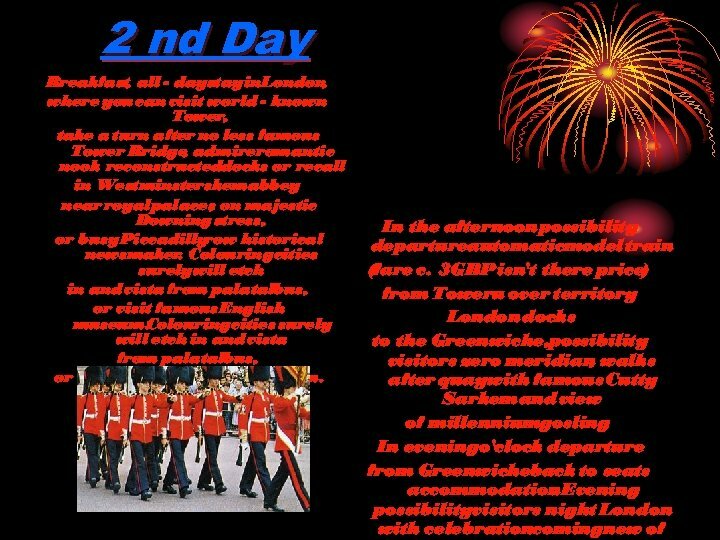 Is also place where British huddle in time national merry - making and crisis. Buckingham Palace is the headquarters of the British Monarchy and is used as both a home and office. Soon after George IV took the throne, he ordered Buckingham House, the London home of his parents, be that destroyed and a new, more suitable residence be built. connecting banks river Thames is pearl Victorian architecture. 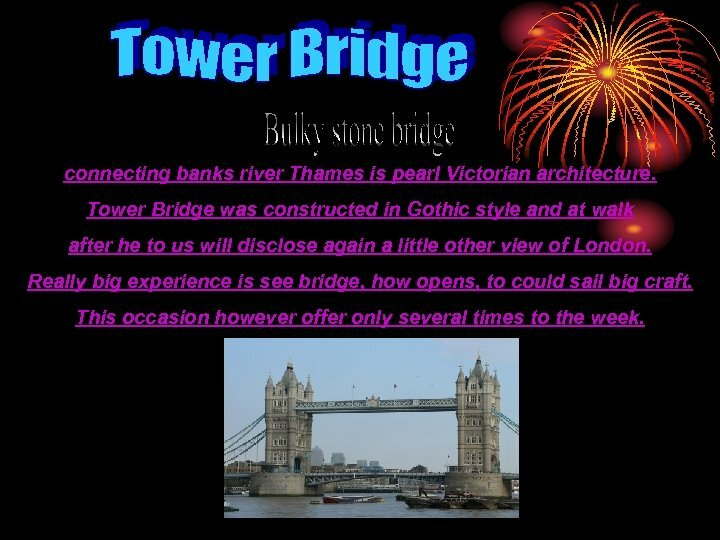 Tower Bridge was constructed in Gothic style and at walk after he to us will disclose again a little other view of London. Really big experience is see bridge, how opens, to could sail big craft. This occasion however offer only several times to the week. 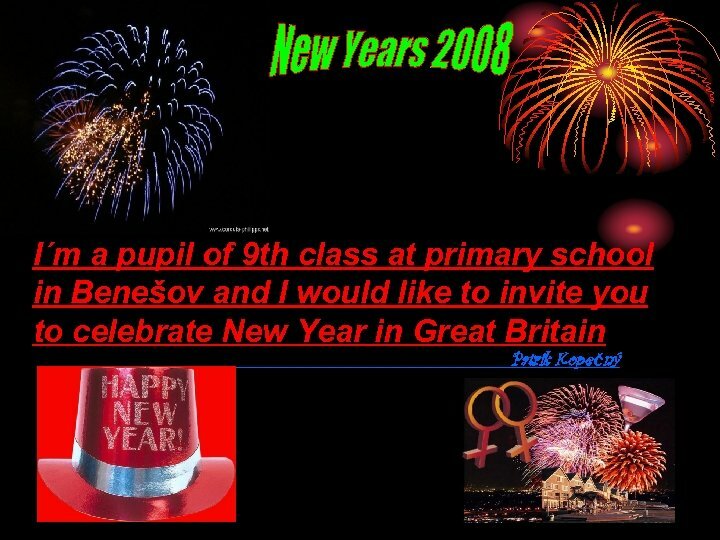 Thanks that you chose our offer: , , New Year's Eve in. England". 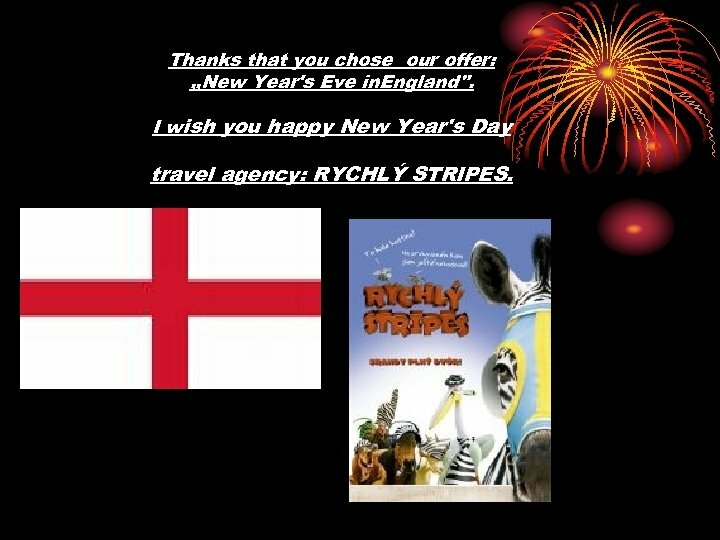 I wish you happy New Year's Day travel agency: RYCHLÝ STRIPES.